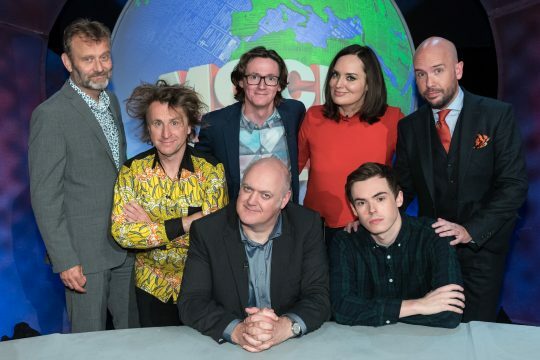 Mock the Week returns to BBC Two from its summer recess this autumn and, as well as finding new ways to tackle Brexit, Trump and England not winning the World Cup, the producers are anxious to celebrate the show’s latest landmark: when Australian comedian Deborah Frances-White debuts on September 14th, she will become the programme’s 100th panellist, the latest in an A to Z (or more accurately Acaster to Yashere) that reads like a veritable Who’s Who of comic genius from the past thirteen years. Blending experienced talent such as Rory Bremner, Chris Addison and Jo Brand with exciting new names from the circuit has been the series’ recipe from show one and the roll call of comedians who have mocked a week early in their careers is truly staggering, including people of the calibre of James Acaster, Angela Barnes, Rob Beckett, Frankie Boyle, Kevin Bridges, Greg Davies, Micky Flanagan, Ed Gamble, Rhod Gilbert, Adam Hills, Russell Howard, Miles Jupp, Nish Kumar, Zoe Lyons, Michael McIntyre, Sarah Millican, Diane Morgan, John Oliver, Andi Osho, Sara Pascoe, Chris Ramsey, Romesh Ranganthan, Katherine Ryan, Ellie Taylor, Seann Walsh, Mark Watson, Jack Whitehall, Josh Widdicombe to name just a lot. As a special addition to this commemorative press release, we wondered if the production team could list 100 Amazing Performer Facts to celebrate the achievement and it turns out they couldn’t, but they did manage 25 moderately interesting ones (see attached sheet). Mock the Week was created by Dan Patterson and Mark Leveson, the creative force behind the iconic improv-based show Whose Line Is It Anyway? which ran for ten years on British TV before successfully transferring to the United States. Ruby Kuraishe is the Executive Editor for the BBC. It is produced for the BBC by independent production company Angst Productions. The second half of series 17 runs for six weeks through September and October 2018. 1) Deborah Frances White will be Mock the Week’s 100th panellist in the 183rd episode (including compilations). 2) The first episode was broadcast on June 5th 2005 and featured Frankie Boyle, Hugh Dennis, Jeremy Hardy, John Oliver, Andy Parsons and the late Linda Smith. 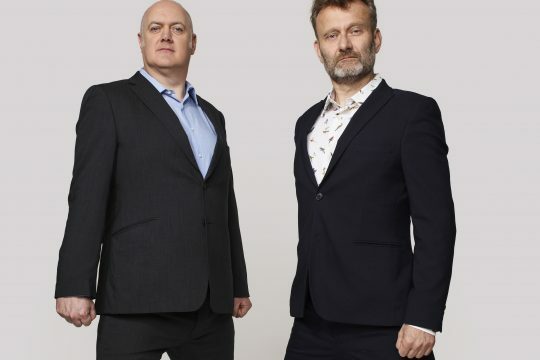 3) Host Dara O Briain and Hugh Dennis are the only performers who have appeared in every single episode (though Hugh was not in the pilot). 4) The series ‘regulars’ have comprised Chris Addison, Frankie Boyle, Rory Bremner, Hugh Dennis, Russell Howard and Andy Parsons. 5) Of the non-permanent regulars, Ed Byrne has made the most guest appearances with 52 (not including compilations and specials) followed by Milton Jones on 41. 6) Ed has made at least one appearance in every series since series three in 2006. 7) 84 different performers have faced the stand up wheel. It has revolved 460 times, selecting 205 topics with Andy Parsons stepping up on a record 64 of those occasions. 8) Rory Bremner was the first performer to volunteer in the first show: he tackled ‘The Tory Leadership Contest’. 9) There have been 51 different topical films used over the years in ‘Newsreel’, with the Queen appearing most often (16) and her husband the Duke of Edinburgh and former Prime Minister David Cameron close behind on 14. 10) Jon Culshaw, Jan Ravens and Rory Bremner are the only other performers to have featured in the ‘Newsreel’ (occasionally called ‘Royal Commentary’) round besides Hugh Dennis. 11) The oldest performer to make a debut on the show was Clive Anderson who was 53. 23 in their 40s and 22 in their 20s, with just four debuting over the age of 50. 14) The tallest performer to appear on the show is, unsurprisingly, the 6ft 8ins Greg Davies. appeared on the show in 2016. 16) The shortest guest ever to appear on the series is 4ft 10ins Susan Calman who just edges out the 4’11” duo of Sandi Toksvig and Lucy Porter. 17) There have been 69 English-born panellists on the show, six each from Scotland and Wales, three each from Canada Australia and the USA, two apiece from South Africa and Ireland and one each from Denmark, Iran, New Zealand, Japan, Northern Ireland and Iceland. 18) The most popular first name of a performer is John: there have been three (Bishop, Oliver and Robins) plus Jon Culshaw as a bonus fourth. 20) 19 performers have appeared on the show wearing glasses, 11 have sported a tie and one each with a hat (Tez Ilyas) and a scarf (Andrew Maxwell). 21) Gary Delaney and Sarah Millican are the only husband and wife to have both appeared on the show, although John Robins & Sara Pascoe appeared-together- as a couple. Rob Beckett and Tom Allen were at school together and Nish Kumar and Ed Gamble were friends at university. 22) Five winners of the Edinburgh Comedy Award have appeared on the show: Al Murray, Russell Kane, Frank Skinner, John Robins and Jeremy Hardy. Incredibly, Frank Skinner is still the only winner of ‘Rear of the Year’ to have appeared on Mock the Week. 23) Panellists Alun Cochrane, Micky Flanagan and Ben Norris were all former studio warm up men for the show. 25) 32 Mock the Week performers were born in London; Glasgow and Bristol are next best with three each.